Night time in Central Park, an undercover police lieutenant checks his wire to see if it works. He’s approached by a quartet of drug dealers who want his briefcase full of money. However, instead of giving him the crack like in the original deal, they just shoot him and make off with the brief case. The Turtles happen to be in the Park and respond to the shot. 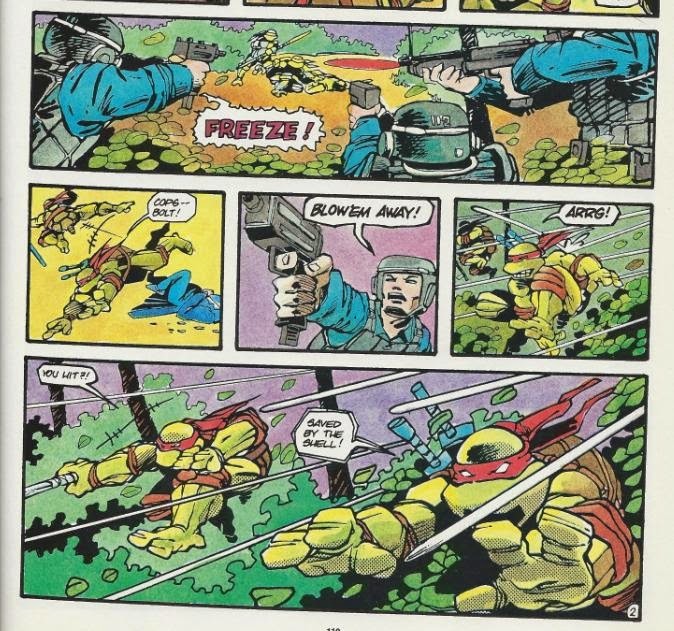 Leo sends Raph and Mike to chase after the punks while he and Don check on the lieutenant. Leo finds him dead from the gunshot, just as the SWAT team arrives and mistakes him and Don for the killers. The cops open fire as the Turtles make a break for it. Leo decides that they’ll cut across 9th Avenue in the direction Mike and Raph were heading, hoping to cross paths with them. Not far away, from atop a building, Raph and Mike spot the punks heading for their getaway car in an alley. As the punks start the vehicle, Raph realizes they’ll never get down there in time to stop them. So instead, he jump-kicks a dilapidated old chimney, sending the bricks down on top of the car. The punks crawl out in confusion, only to be attacked by Mike and Raph. They open fire and try to get away, but are boxed in by Leo and Don. Down the street, several cop cars are moving in, responding to an anonymous tip regarding the Central Park murder. They reach the alley and find the four punks bound and dangling from a fire escape with the briefcase full of cash littering money all over the place. Elsewhere, on the rooftops, the Turtles reflect on the night’s events. Don is pondering if they did the right thing by letting the punks live. Raph half-heartedly thinks they did, while Mike more strongly seconds the notion. As the sun rises, Leo tells them to head back to the lair. 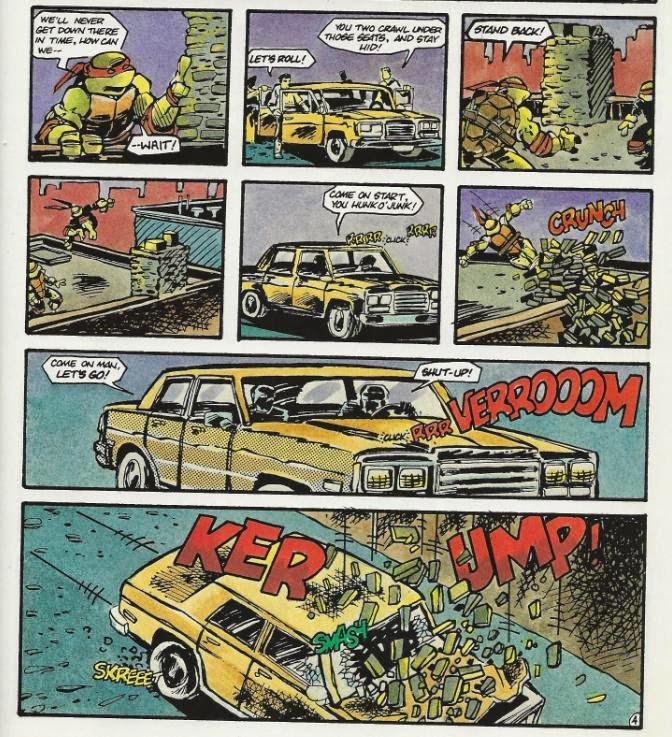 *This story was originally published in TMNT Book I by First Comics. Originally printed in color, it was reprinted in black and white for the “Shell Shock” trade paperback. 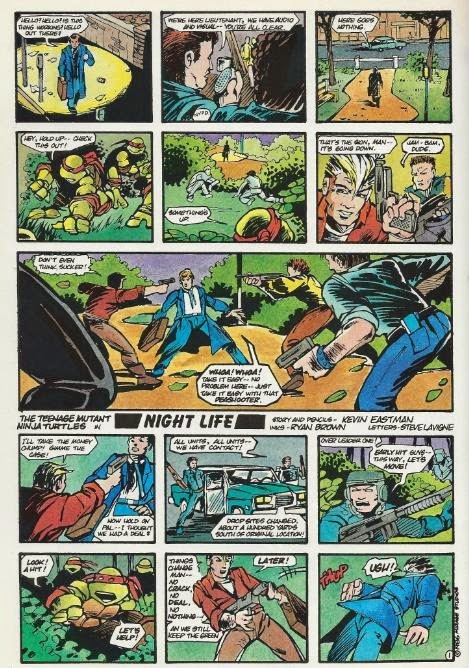 “Night Life” is actually one of those little back-up strips I completely forgot existed, even though I own the thing twice over by now. In all honesty, it isn’t one of the better ones in either the art or story departments, which probably contributed toward it fading from my memory. Story-wise, it lacks the pizzazz of Eastman’s other back-ups, like “Fun with Guns” or “Crazy Man”, even if it does share in his usual gritty, street-level view of the Turtles. There’s simply nothing exciting or stand-out about the plot; no punchline to speak of at the end or any twists or turns. The Turtles see a guy get shot and they go beat up the punks who shot him. End of story. Artwise, it’s probably the poorest work I’ve seen from Eastman and I get the feeling he really rushed this story out for the First Comics color collection. My primary problem is that there are just too many panels per page. I mean, just look at that scan up there at the top of this review. That’s what the whole six-page story looks like. It looks more like a collection of Sunday newspaper comics than anything else. Detail is at a minimum and so much of it looks quite frankly unfinished, like Ryan Brown simply inked Eastman’s thumbnails and not the completed pencils. When it comes to a choice between the color or black and white versions, meh, neither is really any better than the other. However, if the color version has one saving grace, I suppose it’s that the extra polish helps to distract you from the mediocre artwork. Overall, “Night Life” is about as bland and boring as it gets. The IDW TMNT Classics version looks much better, but there were some silly miscolorings. They mistook the parking meters in the first panel for street lamps (very small street lamps...) and they colored Donnies bandana as a continuation of his bo staff in one panel during the battle. All in all I would rate it C- as it's a nice insight in one of their early patrols and encounters with the police.